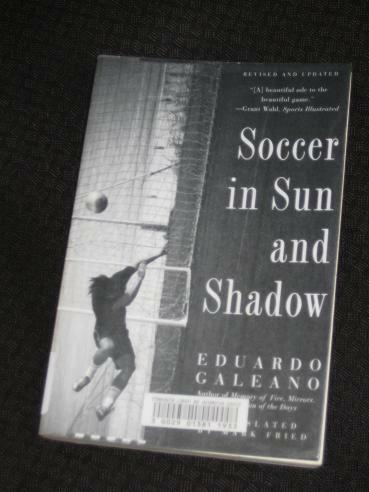 Author Eduardo Galeano is a lifelong football fan, even if (as he makes clear at the start of his book) his ability on the field fell far short of his writing capabilities. For that reason, he decided to devote time to writing about his love for the game, and Soccer in Sun and Shadow (translated by Mark Fried) is the result. First appearing in 1995, the book was recently released in an updated edition, extended by twenty pages or so to reflect on developments over the past twenty years, with a few extra comments also scattered throughout the earlier passages. The book consists of a series of vignettes, most of which run to well under a page. At the start of his musings, Galeano introduces us to the basics of the game, running his eye over subjects such as teams, managers, players and the all-important supporters. Less informative than speculative, these pieces examine the roles of the various agents in the world of football, with the writer’s poetic touch usually in evidence. Once we’ve warmed up, we’re on to the main game, and the backbone of the book is provided by short recounts of all the FIFA World Cups. Between these brief history lessons, Galeano goes off on slight tangents, looking back at famous players and memorable goals, casting a loving eye over his favourites. For a football lover like myself, much of this is familiar fare, but there are some new gems. In particular, the South-American slant means we’re introduced to players and events that never quite made it across the Atlantic. The history of soccer is a sad voyage from beauty to duty. When the sport became an industry, the beauty that blossoms from the joy of play got torn out by its very roots. In this fin de siècle world, professional soccer condemns all that is useless, and useless means not profitable. However, if I’m honest, I can’t say I agree with all those readers hailing this as a classic. Once you get into the book, it becomes fairly repetitive, even dull at times, as the pieces blur together. It might all be fascinating to the football novice, but for someone like me who grew up in a football environment (I knew where all the World Cups had taken place, and the scores of the finals, by the time I was about eight…), there isn’t really much here to hold my attention. My interest in football has declined rapidly, especially regarding club football. I want something radical to happen, a change… I hate all the money being thrown around. And the Champions League is so stale to me. Jeff – I don’t really follow it as closely as I used to, and I tend to be more interested in football here than overseas (it’s been a big ten years or so!). The A-League has improved a lot. Initially when it started, I hardly watched it, as I found the matches painful viewing, but the past few seasons it’s clear the standard has been raised. You can see that with guys like Aaron Mooy, coming from the A-league and having success overseas.